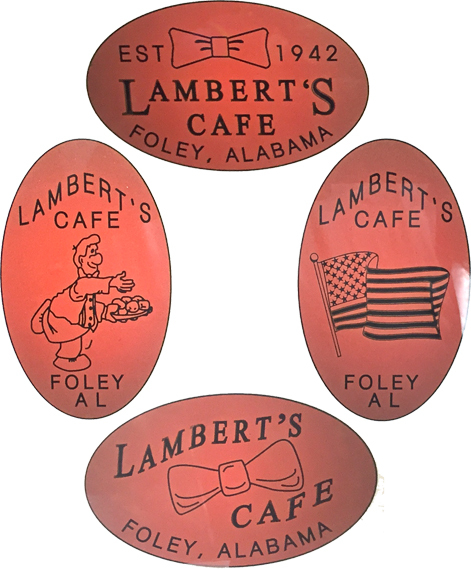 LAMBERT S CAFE is located in beautiful Foley, Alabama., eight miles north of Gulf Shores. This cafe is located next to a factory outlet mall and a wide variety of places to visit. One of the greatest attention grabbers at the cafe is the fact that the BEACH is located no more than eight miles away. There is one machine in the gift shop and one in the room as your leaving. You can collect 8 different pennies in all. Penny booklets there are 6.99 plus tax. 3) Home of the Throwed Rolls. Machine 3: (2016) 4 designs. Retired 2 Designs: All are two-side "mule" designs and include "FOLEY AL, throwedrolls.com" on the reverse. 1) Mascot throwing rolls, 2) Restaurant, 3) Home of the Throwed Rolls. thegillion added Lambert s Cafe to system.